A range of units that interface between most types of Vibrating Wire Sensor and various network protocols for use with Data Loggers and Data Logging systems. 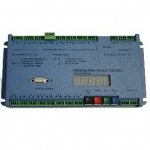 The VBW-108 is an 8-channel Interface Unit for Vibrating Wire Sensors. Each channel consists of 2 inputs for the sensor coil and 2 inputs for associated thermistor temperature sensors. The unit is compatible with sensors from most of the major manufacturers.